Friends, family, loved ones, it’s Team #3 here on Kilimanjaro. From here on out we are no longer “Team #3”, we are “Team Poa Kichizi Kama Ndizi”. In other words “the Crazy Bananas” — we are “The Crazy Bananas”. We’re here on Kilimanjaro at Shira Camp (12,500 feet). We had a wonderful day today, lots of sunshine unlike yesterday. Lots of singing on the trail (singing in background), we have a very vocal group. We reached Camp very early so we had lots of downtime to rest and relax. It’s about 8 o’clock right now. We just had some fried banana for dessert after stuffing ourselves silly. And we’re going to go to bed soon. 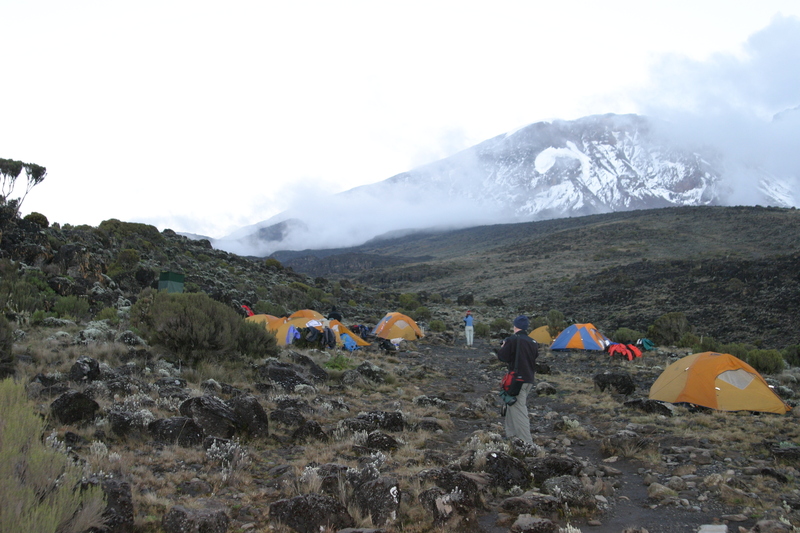 Tomorrow we’ve got a long day to Barranco Camp via Lava Tower at 15,000 feet. We’ll give you a shout tomorrow. Keeping the route in Shape!